Getty Images for WiredEssential founder Andy Rubin. Rubin’s company is working on a new smartphone that would perform tasks without any instruction from the user, Bloomberg reports. Using artificial intelligence, the phone would be able to send texts, respond to emails, and schedule appointments – all on its own. Bloomberg reports that the device wouldn’t look like a typical smartphone, but instead just have a small screen. Consumers would use voice commands to interact with the device and work with the AI technology. Essential is trying to have a prototype of the phone finished by the end of the year, according to Bloomberg. Rubin’s vision isn’t far off from the technology in “Her,” a 2013 movie where a man falls for the artificially intelligent operating system that performs tasks on his phone. Warner Bros.In the film ‘Her,’ Joaquin Phoenix falls in love with his computer operating system named Samantha. This latest technology venture could be Rubin’s attempt to keep the struggling Essential afloat, especially since reports emerged in May that the Android creator was thinking about selling his company. 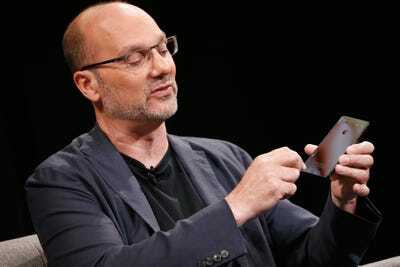 Rubin unveiled his Essential PH-1 smartphone last year to positive reviews for its sleek design, but Bloomberg reported in May that the startup only sold around 150,000 phones and was forced to slash the price by $US200. Essential has paused work on a second generation of the phone, as well as on a smart home speaker, so this AI-powered phone would seemingly be Rubin’s third attempt to launch a successful device since his startup was founded in 2015. Up until he left Google in 2014, Rubin helped launch and run Android, which is now the most-used mobile operating system.It was revealed in late 2017 that an internal complaint from Rubin’s time at Google alleged he had an “inappropriate” non-consensual relationship with a coworker.